Trofeo Kima, the Kima Trophy, has crowned its new king: in the final kilometer the Nepalese athlete Bhim Gurung overtook an exhausted Marco De Gasperi to seize victory and beat the course record for this iconic race on the Sentiero Roma. 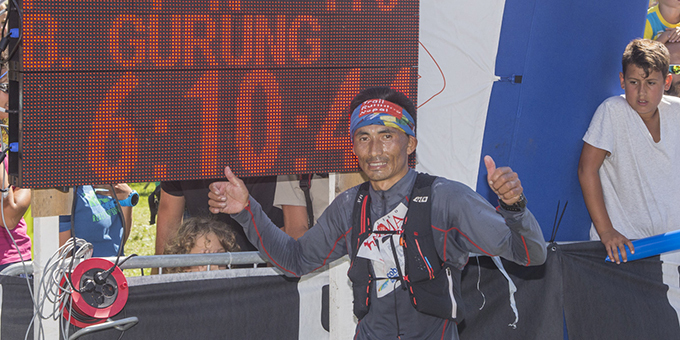 Both Gurung and Bormio-born De Gasperi broke the previous record held by Spain’s Kilian Jornet, lowering the mark to 6h10’44” by Gurung. 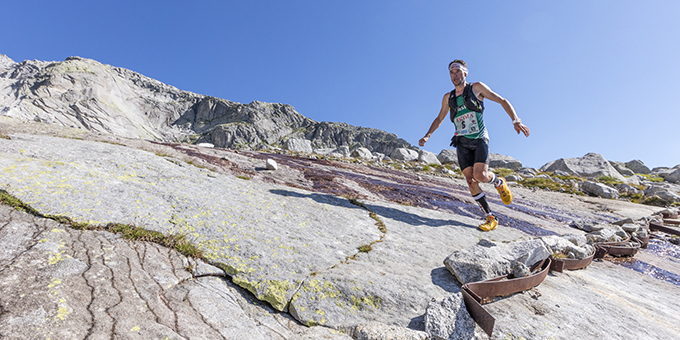 Second place went to Marco De Gasperi (6h12’09”), who ran with steely grit in his eyes in front of his home crowd. Making a break on the final stretch towards the finish, it looked likely that De Gasperi would take the win, however, Gurung’s last-ditch efforts paid off to see him clinch victory. Third went to the ‘crazy boy’ Leo Viret in 6h13’19”, with Alexis Sévennec (6h15’05”) in fourth, and Britain’s Tom Owens in fifth (6h15’55”). Athletes from the early break filled the top five positions, followed by Genis Zapater, Jonathan Albon, Christian Minoggio, Matteo Piller Hofer and Stefano Butti. Alessandro Bonesi (14th) and Valentino Speziali (19th), two local runners, both had great races on their home turf. The women’s field saw Team Salomon’s Emelie Forsberg from Sweden take an early lead, pursing victory from the front to settle the score from her ill-fated second place in 2014. Forsberg clocked a magnificent time of 7h49’06” ahead of Ruth Croft 8h06’45” and Emanuela Brizio, third in 8h21’42”. 278 ourageous runners took to the start line of this legendary race, with an exuberant crowd supporting them throughout the 52 technical km as they scaled seven Alpine passes above 2,500 metres and a total of 4,200 metres of climbing. The history of the Trofeo Kima stretches back three decades, but the numbers from today are what render it one of the most spectacular editions of the past 10 years. 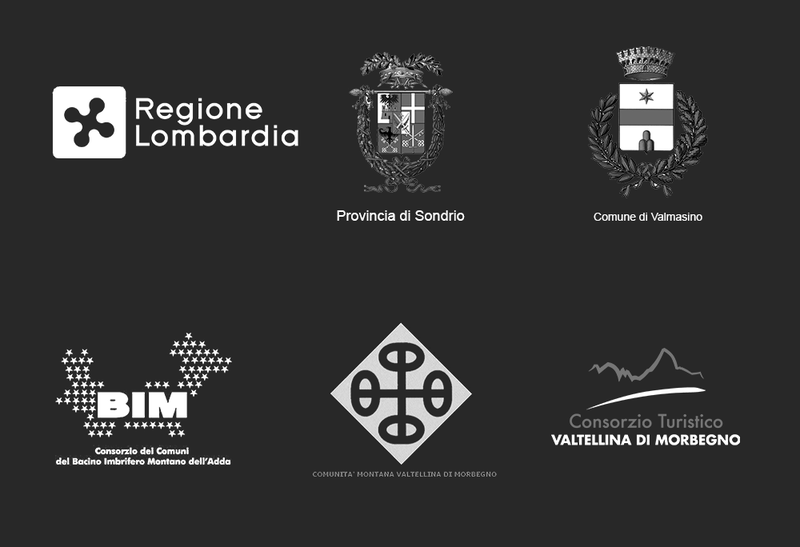 Now under the guidance of the Operatori della Valmasino for the first time, today’s race can be declared an outstanding success and is testament to the experience they’ve gained as the organisers of Melloblocco. 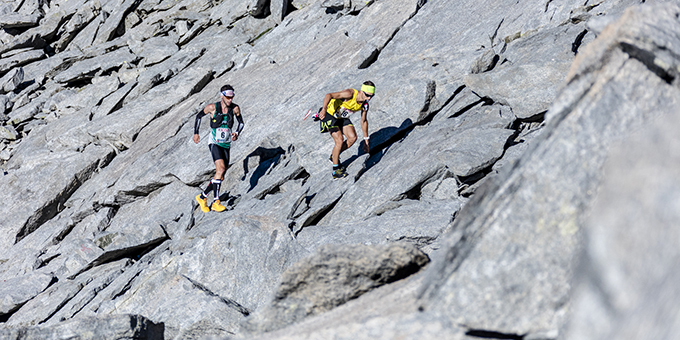 Given the dramatic figures and the new organisation, the International Skyrunning Federation (the ISF) took the decision to include the Trofeo Kima in the Skyrunner® Extreme Series 2016, ranking it as one of the most technical races on the world circuit. The gun went at 6.30am and the field stretched out almost immediately, with an early pace towards Bocchetta Roma set by a strong group of athletes. With 2,000 metres of climbing and the first checkpoint behind them, the French duo of Leo Viret and Alexis Sevennic pushed ahead accompanied by Italy’s Marco De Gasperi. Britain’s Tom Owens and the Spaniard Manuel Merillas were never far behind. Amongst the women, Sweden’s Emelie Forsberg was shadowed by Ruth Croft from New Zealand, with Italy’s Brizio chasing in third. The men’s leading trio, consisting of the two French athletes Viret and Sevennec as well as De Gasperi, were still in the lead at the Passo del Cameraccio, although they had been joined by Nepal’s Bhim Gurung by the time they reached Torrone. 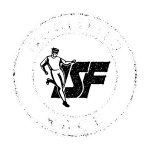 While Emelie Forsberg dominated the women’s field, running alone for the majority of the race, there was an ever-changing leadership in the men’s field. By the time the breakaway reached Gianetti, Viret was leading ahead of De Gasperi, Sevennec and Gurung. On the final descent towards the historic thermal baths, Bagni Masino, the quartet were joined by yet another pre-race favourite Owens. However, as the race drew to its conclusion along the bike path to Filorera, the efforts of De Gasperi were overshadowed by the strength and speed of Gurung.